The post-compo version of is now live on Kongregate! Special thanks to Chris for whipping up a brilliant song in such a short time. 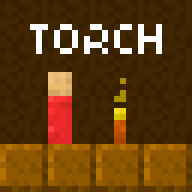 Torch is my Ludum Dare #20 entry. The theme was “It’s dangerous to go alone. 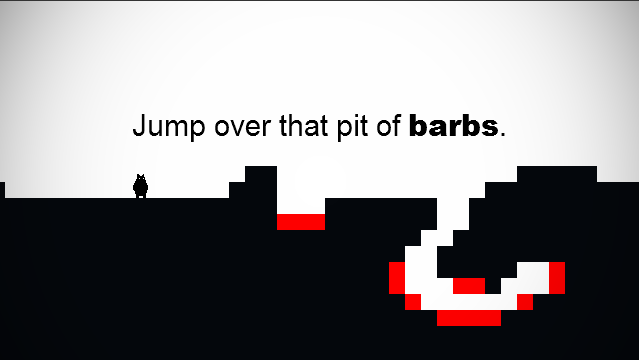 Take this!” I had already set my mind to making a platformer prior to the competition. Once the theme was chosen, I immediately started thinking of a companion cube like object to give the player. A torch actually came to my mind first but I was scared that the lighting system would take too long. After about an hour into brainstorming I figured a torch was my best bet at an interesting game. I first tackled the physics which took a bit of time as I had never worked on a platformer before. After a few hours I got to a point where it was acceptable even though it’s still a little buggy. The lighting system must have taken me the longest. I first tried using a similar system to Voyage of Discovery, but it didn’t fit well with a physics based platformer. I then tried the standard circle gradient but it looked way too tacky. What you see in the final version is a few hours of tweaking and browsing forums posts. 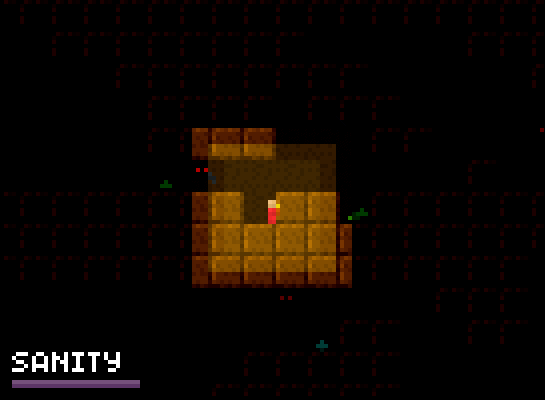 I’m quite proud of the effect outside of the torch’s radius which distorts the level yet still allows the player to see what’s around them. 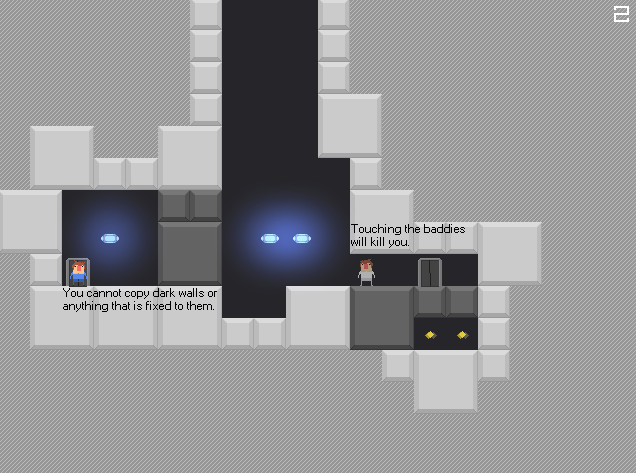 After the lighting, all that was left was to add hazards and create the level. After getting through a few creatures, I realized I wouldn’t have enough time to finish. I ended up rushing the level design and only doing a few play tests. I’m disappointed that I didn’t have more time to add a few more creatures and detail the tileset before I submitted it. 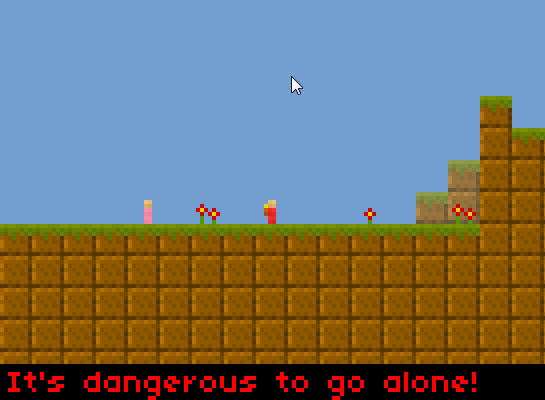 Nonetheless it turned out to be an interesting little game that I plan on polishing up for a post-compo release. A few people left comments about the blind jump near the end of the level. It took me a minute to realize they were talking about the ‘forked path’ section. 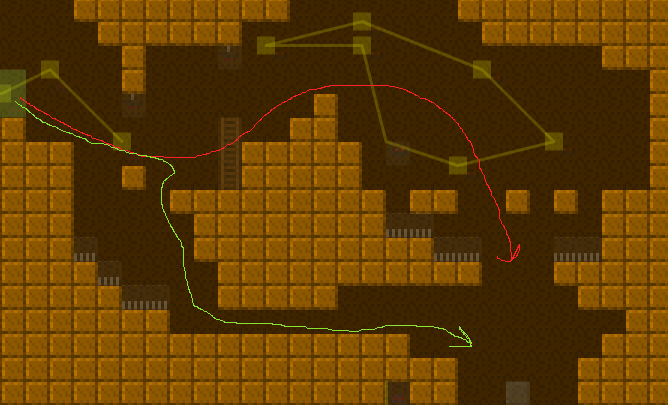 In the image above, players who complained about the blind jump were following the red line. To actually get past this section, you are supposed to follow the green line. 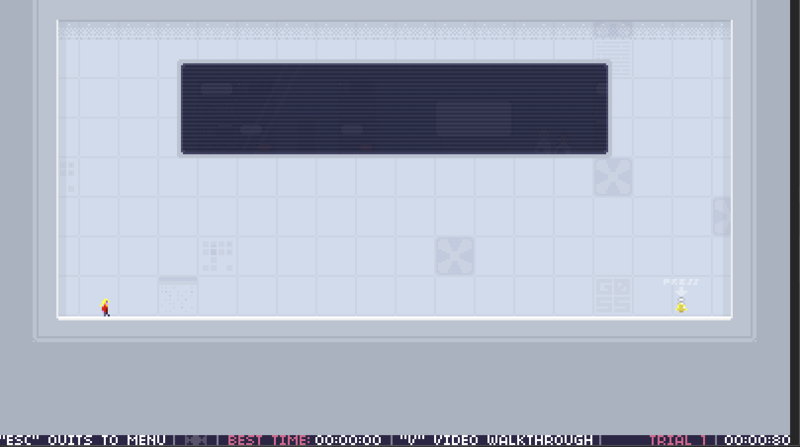 This was a bit of a design flaw on my part because the hidden route isn’t quite visible enough, but I figured players would see the path once they tried jumping down and dying. Quick Understanding of Block Extrusion, or Q.U.B.E, is a short 3D platformer. (It only took me about 20 minutes to finish) The focus is on the player’s ability to extrude cubes within the environment to get to the next area or solve a puzzle. If you liked Portal, then this is worth your time. Liferaft: Zero is a devilishly hard platformer that reminds me of Portal. No it doesn’t have mind bending portals, but the camera’s with the camera’s watching you, the scientists behind glass windows, and the clones give me deja-vu. Did I mention there is cake candy? Jump, Copy, Paste is “yet another of those platformers-with-a-twist”. It has what you expect from a basic platformer; baddies, jumping, obstacles, etc but the core game mechanic is what makes this title shine. You can copy and paste parts of the level to aid you to the door at the end. Which includes walls, boxes, and even bullets shot from traps. You must try this one out! 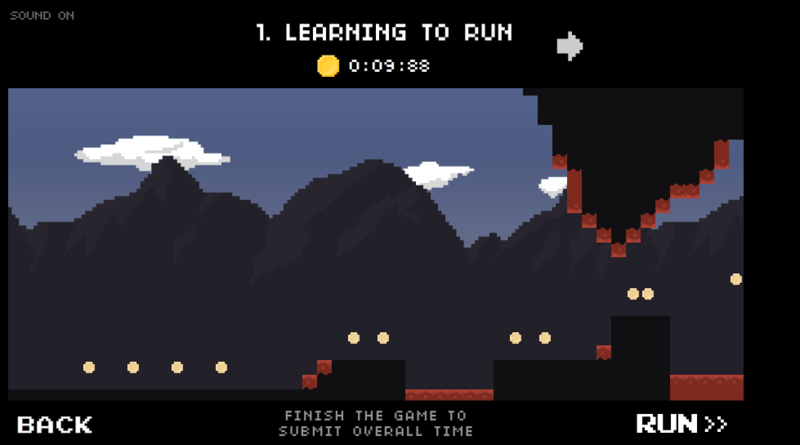 Mr Runner is a fantastic fast paced platformer. The goal of the game is to run through the level and reach the end as fast as possible while collecting coins along the way that decrease your time. It’s quite hard, as the disclaimer below proves when you first start up the game. But don’t let it stop you from playing!